SEOUL, July 2 (Yonhap) -- For anyone struggling to balance work and family, or rather work and housekeeping, a skilled domestic helper would come in handy. If the helper can help sort out a tangled personal life, it would be the icing on the cake. KBS 2TV's new Wednesday-Thursday series "Your House Helper" features this perfect male domestic helper, who is good not only at housekeeping but also problem-solving and counseling. This too-good-to-be-true story is based on the popular web comic series of the same name by Seung Jung-yeon, which is now in its fourth season. Producer Jeon Woo-sung said the series doesn't have the familiar formula of Korean dramas like extreme villains, chaebol heirs, a fairytale like Cinderella or a rags-to-riches story. "The drama is about a house helper and four customers. They clean their houses together and heal wounded hearts in the process," he said during a media promotion event in Seoul on Monday. "While they are tidying up their homes, some start falling in love and others recover friendship. It is a very warm and bright story." Acknowledging many difficulties in visualizing the web comics on screen, the producer said he worked hard to make the characters more relatable and the story more feasible. 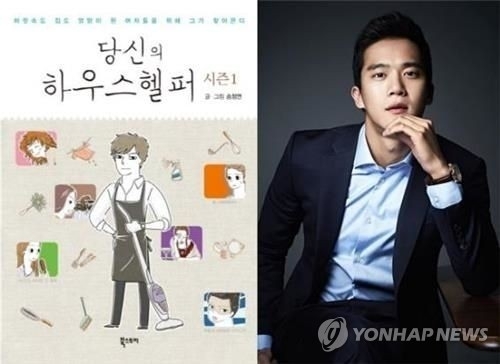 Actor Ha Seok-jin plays the mysterious helper Kim Ji-woon who helps out four female customers -- Im Da-young, Yoon Sang-a, Han So-mi and Kang Hye-joo. The four young characters have their own personal issues and struggles, but they began seeing a silver lining when they meet the helper. According to the director, the helper doesn't solve problems by himself but just is there with his customers to give support. And his customers find their way out of deep pits in their respective lives. Except for the main character, the other cast members are all up-and-coming young actors, mostly in their early and mid 20s. Casting unfamiliar actors, the director said, was intentional to make the story feel as if it was happening near the viewers. "Cleaning up houses is quite fun to watch. It is way more interesting than you might expect it is. It feels as if you are healed," he said. The drama will compete with other TV series in the same time slot where cable channel tvN's "What' Wrong With Secretary Kim" dominates the viewership ratings chart. Its latest episode peaked at 8.1 percent. While actor Ha didn't specify how strong he hopes the ratings are for the drama, he said, "I promise to go to viewer's houses for cleaning" when the drama records "as good a rating as other shows in the same time slot." The drama will premiere at 10 p.m. on Wednesday on KBS 2TV.